Songs and Chants- There are not a lot of traditional Halloween songs that are great for kids, so I have made several songs for teaching Halloween. Sing about Favorite Pumpkins, Ghosts and Witches, and Chant about the Halloween characters. Check out all of our Free Download Halloween Songs here! 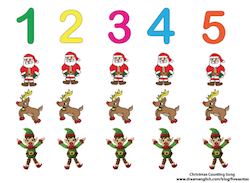 Games – You can use Halloween themed flashcards and do any of the fun classroom games I recommend on this page. I like to play a “Trick or Treat” game with the kids. Have the kids line up and knock on a pretend door. They have to say, “Trick or treat” then I ask “What are you for Halloween?” The students can either choose a character, or hold a character card to answer. Next we play Rock, Scissors, Paper, and if the students win I give them a pretend Halloween candy made out of paper. We go through the line a few times to make sure every students gets a paper candy. At the end, we count how many paper candies each student has. Simple and fun! Worksheets and coloring – We have several worksheets on the Dream English Halloween Page. 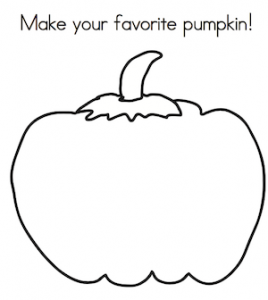 One of my favorites, is the draw your own pumpkin worksheet. This lets the kids be creative, and have a lot of fun. Be sure to show several examples of Halloween pumpkins to get their ideas flowing. Halloween Books – There are many great Halloween children’s books available at your local bookstore. Make sure you choose books that are age appropriate, and not too scary. We have this fun and simple My Favorite Pumpkin book that you can download for free. Print it, and have a blast reading it to your students. After the book, sing the Favorite Pumpkin song with your students! Halloween Parties- Halloween is a fun time to host a party! You can have a classroom day be a Halloween party, or schedule a separate time to have an informal, non classroom setting party. Play Halloween games, read books, do some trick or treating activities, sing some songs. The idea is to get your students out of their normal classroom environment using English. I hope this helps give you some ideas of what to do this year in your ESL and EFL classes for Halloween! Check out the Dream English Halloween page for more ideas, songs, and worksheets. Happy Halloween!